Join us for our next walk to hopefully take in the beauty of the Bluebell Woods near Soudley in The Forset of Dean. We will be meeting at the Dean Heritage Centre at 11:30, for those who wish to have a spot of lunch in the cafe prior to the walk. For those who want to just do the walk, we are setting off for about 1:30. The walk is around 5 miles long, so should take us to about 4ish. Or if you prefer you can spend the afternoon at the Museum. Our third Art Therapy Session will be on Monday 4th April from 7pm to 9 and will be about how we can enjoy making a creative mess using ink, paint and paper ! UnfortunatelyMaggie is unable to attend so Steve leading this creastive and expressive session. Enjoy! If you are interested in coming along please take note that the room can only hold 8 folks so you will need to register. The Beacon is a new Charity that has been set up to help the people in the local community who suffer with depression. 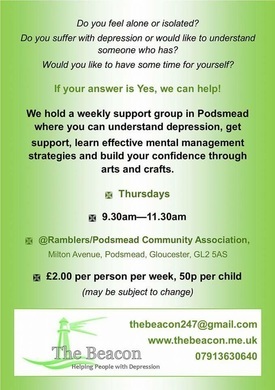 They meet every Thursday at Podsmead Community Centre from 9:30am to 11:30am.